Lake District Mountain Biking - Guide Book - £15.95 including P&P - Local Articles - Mountain Bike Cumbria - beautiful trails and information from throughout the Lake District and beyond! The latest in the best-selling VG guidebook series, Lake District Mountain Biking is a new, compact, comprehensive guide to the best riding in the English Lake District. It contains 27 routes between 12 and 60km long. These routes, put together by Chris Gore and Richard Staton, are again plotted on Harvey Maps and illustrated with photography by Andy Heading. A compact guide to the best riding in one of the best mountain biking areas in the UK - 224 pages. Explore classic rides around Walna Scar, High Street and Borrowdale and discover several lesser-known gems. Ride moorland singletrack, tackle massive climbs and rattle along some of the rockiest trails you'll ever encounter on two wheels. Enjoy lakeside cruises, picturesque valleys and 360's using easy-to-follow directions, they are graded for difficulty and plotted on Harvey Maps. A special bonus section includes the best downhill runs, climbs and cruises in the area and special visitor information about the region. Twenty-seven routes, ranging from 12 to 60km in length, graded to indicate their varying levels of difficulty. Each route is described using clear, easy-to-follow directions, features Harvey mapping and a route profile. Illustrated with colour photography and contains route-specific information. The guide's compact size and weight allows it to be carried easily. 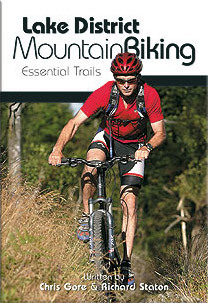 The sixth title in Vertebrate best-selling series of mountain bikeguides. All the maps and descriptions in print-ready files for your PC or Mac. Save weight! Leave the books behind and just pack the map and description you need. Get the book and the CD-ROM together and SAVE £2.45! Trail Guides are available to buy from Vertebrate Graphics. This trail has been viewed 77906 times!